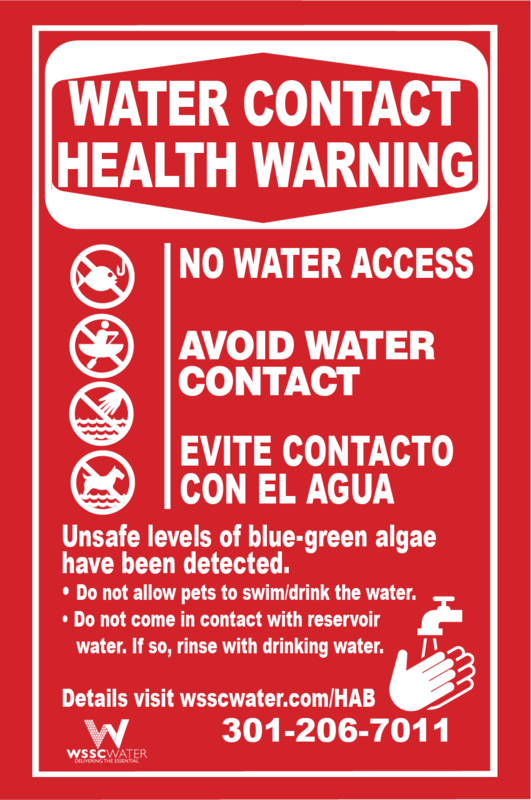 As part of its water-quality monitoring program, WSSC monitors its reservoirs for blue-green algae (or cyanobacteria). Cyanobacteria are normally present in lakes and reservoirs and thrive in warm, nutrient-rich water. Cyanobacteria are present all year, but populations typically peak during summer and early fall. When conditions are right, they can grow quickly forming “blooms.” They are often described as looking like pea soup or spilled green paint. 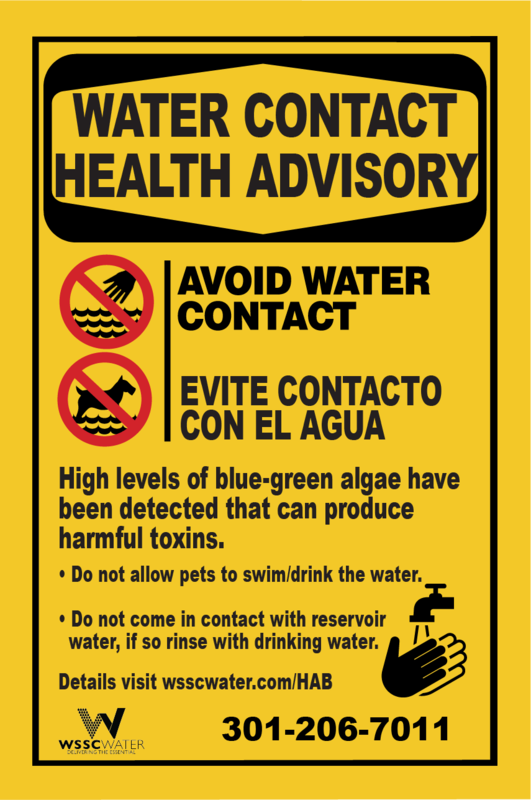 Some algal blooms may produce toxins and can become harmful to humans and animals in contact with the water, otherwise known as a harmful algal bloom (HAB). Harmful algal blooms can also adversely affect pets and there are reports that some pets have died from contact with such toxins. WSSC watershed regulations prohibit pets from being in the water. Harmful algal blooms can also create dead zones in bodies of water, which may kill aquatic life, raise treatment costs for drinking water and hurt businesses and jobs that depend on clean water. If high levels of cyanobacteria are detected, WSSC increases water-testing efforts to closely monitor the status. Because the reservoirs also serve as a drinking water sources, we closely monitor toxin levels at the treatment plant as well. In the event that you, someone you know or a pet has contacted or ingested water at either reservoir, you should call your local Health Department, listed below. WSSC will post signs at that site’s recreation areas and post alerts on the WSSC website in order to limit or prevent recreational water contact until concentrations decrease to an acceptable level. There are two levels of alerts: advisory and warning. Examples of the signs are below.